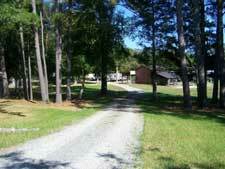 Contact for Jordan Dam RV Park/Campground - Reservations and driving directions from Raleigh, Pinehurst and Chapel Hill, NC. Please call (919)770-6890 for rates and reservation. All messages will be returned promptly. Follow US 1 south approximately 25 miles. Take Pea Ridge Road Exit, #81. At the stop sign, turn Left onto Pea Ridge Road. Travel to end of Pea Ridge Road (approximately 1 mile) and turn right at stop sign onto Old US 1. Travel approximately 2 miles and turn right onto Moncure School Road at Ray's Supermarket. Jordan Dam RV Park/Campground is located 2/10 mile down the road on the right. Follow US 1 North approximately 30 miles. Take Deep River Road Exit, #79. At stop sign turn right. Travel approximately 2 1/2 miles and turn left onto onto Moncure School Road at Ray's Supermarket. Jordan Dam RV Park/Campground is located 2/10 mile down the road on the right. Take US 15/501 South out of Pittsboro. Turn left at stoplight on to Moncure Pittsboro Road. Travel approximately 8 miles to stop sign. Turn left onto Old US 1. Travel approximately 1 1/2 miles and turn left onto Moncure School Road at Ray's Supermarket. Jordan Dam RV Park/Campground is located 2/10 mile down the road on the right.